What is quality and relevant content? The most important determinant of the quality of your content is its uniqueness. Like people, search engines want to see unique information. Imagine if the opposite was true, the internet would be full of irrelevant information that can be found in multiple locations. What a terrible place this would be! Since search engines strive to deliver value to their users, they penalize the use of duplicate content. In order to rank high on SERPs, you need to have original content that adds value to your users. Furthermore, you must base your content on solid keyword research: you must know how your users communicate their intent and what information they are looking for. You must build your content around the keywords and language they use. When you think of your site content, think of value. How does your content add value to your users and your community? People and search engines alike will reward you based on how much you contribute. In order to be clear on what content you must produce, you must first define your buyer persona(s). This is a semi-fictional representation of your ideal customer or user. To define your buyer persona you need to conduct market research, as well as incorporate real data from customers you might already have. When you create your buyer persona(s) consider his/her demographics, behavior patterns, income, motivations, problems, and goals! This is where good keyword research really pays off, as it can help you be as accurate as possible in framing the specific language that your persona(s) use. Understand your audience and their needs. Define your goals and objectives. Know what you want your audience to do once you attract them. Plan and research your target keywords. Know the language of your audience. Involve your whole organization. Make sure everyone in your organization respects your online reputation. Research the latest trends in your industry. Know all the latest developments in your business environment and industry. Additionally, to better manage your content you will need a sound content management system which lets your team collaborate. In order for your site to rank high on SERP, you need to constantly update it and create new quality, and relevant content. This can take a lot of time and resources! By leveraging the interest and knowledge of your site visitors you can let them create new content for you. This practice is called user-generated content. It is a very scalable and cost-effective method of content creation. Some good examples are forums and blog comments, votes, product reviews, articles, testimonials, case studies, etc.. The drawback is that you need to have some sort of approval process in place to ensure users cannot post inappropriate things. Once confident you have clearly defined your buyer personas and their needs you are ready to start creating this keyword optimized, quality, and relevant content. Here are a few guidelines we find that work best when writing for the web. Use the words your users use. Use short sentences and simple language. Using complex sentences and words can actually make users perceive you like a less authoritative source. Chunk your text. Since users typically scan through the text they see, you can make your content more scannable by splitting it in chunks. After all, who would want to read a page long paragraph! Use bullets and numbered lists. Reading one sentence with two bullets is easier than reading three sentences. Have clear subheadings (H1, H2, etc), and use keywords in their text. Use videos, images, and other media to visually communicate and support your ideas. Front lead with important information. It sounds counter-intuitive, but in reality, when people read on the web they expect the learn the lead information first and go in the details only if they are interested. Use keyword variations. It is very tempting to mention the keywords you want to rank for as often as possible. This practice of loading your content with keywords is called “keywords stuffing”, and apart from hurting your SEO ranking, it can also annoy your users. To avoid this use variations of your target keywords and synonyms. Search engines are getting better and better in understanding the actual context of content. They now begin to look more and more into the whole semantic and thematic structure of content. As a best practice, if something doesn’t sound natural to you, avoid it. Creating quality and relevant content for your site is probably the most important aspect for your SEO and business goals. Once you have a good plan for what content your users need you to consider how to organize it on your site. 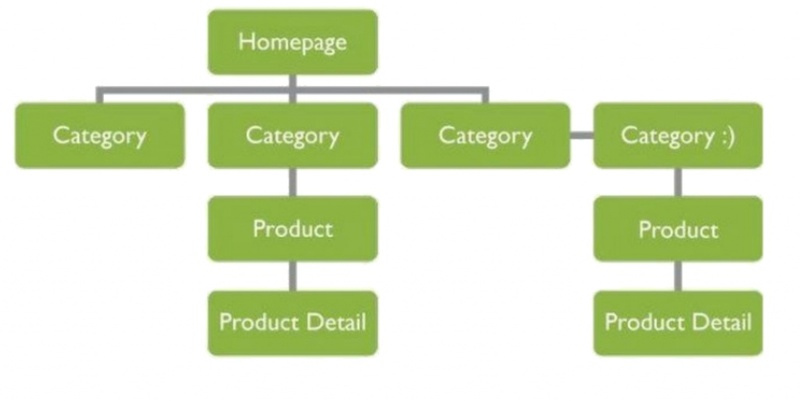 What Site Structure Should You Choose? It is very important to structure all your site pages in a meaningful way. In order for search engines to direct users to your pages they first need to understand how your pages relate to one another. 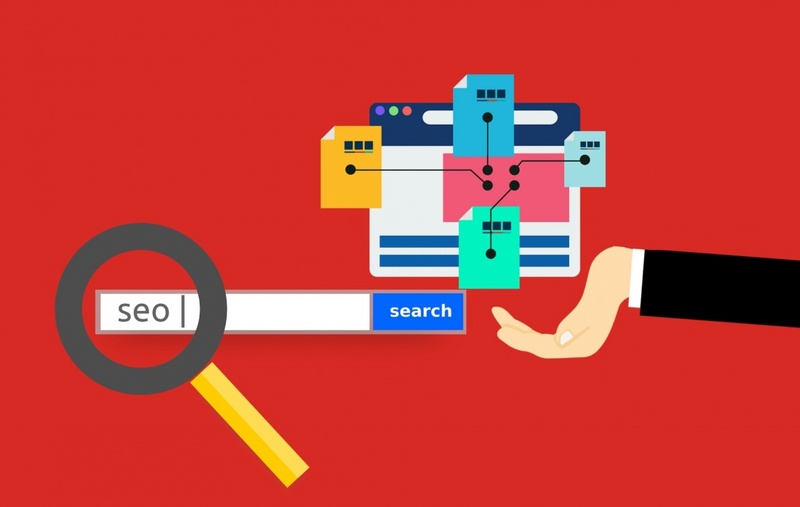 Choosing the right site architecture is important because search engines crawl your entire website to find out what content is there, how it is organized, what it is about, and where can it be found. The speed at which users can find what they are looking for is normally a sign of a good or bad site architecture; in the SEO industry we tend to relate this to the number of times a user needs to clicks from the homepage to find the product or service they are looking for. 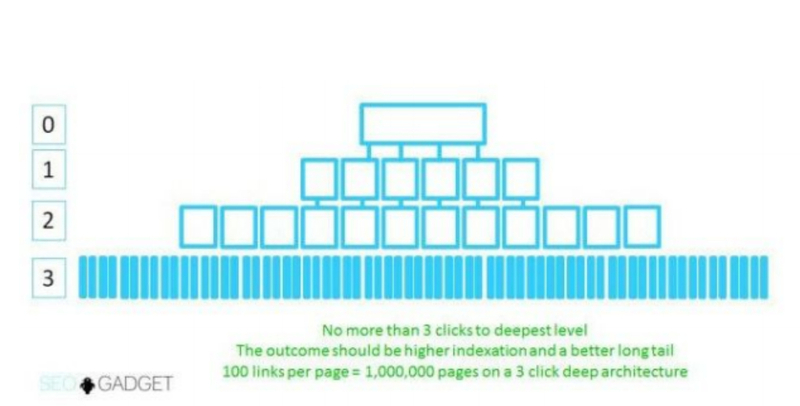 Pages that are fewer clicks from the homepage receive the most link equity so that they have a better possibility of ranking well for competitive terms. Note: Link Equity (also referred as Link Juice) is the amount of PageRank a given page on a website is thought to be able to pass to another internal or external page through a link; the more inbound links a page has, the more link juice it contains and can, therefore, pass along. If you think about it, it makes sense that site owners have their most authoritative pages at the top of their architecture, and the least important pages are “buried” on deeper levels. Because of this, ideally, you want to have a flat architecture where possible as it allows the search engines and users to find your content with fewer clicks. 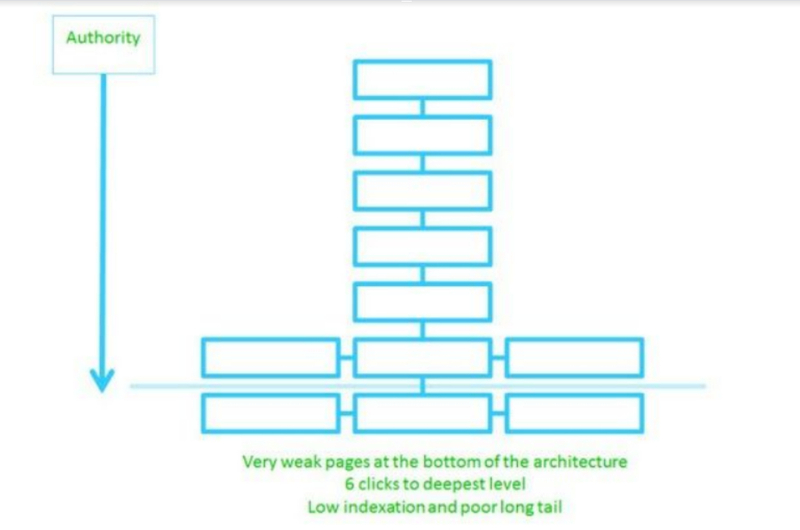 The images below are from Richard Baxter at SEOgadget and illustrate a flat architecture vs. a deep architecture. As a rule, the deeper into a site a page lives, the lower the authority of that page. This happens because of the PageRank distribution. Typically the home page of a website will be the most authoritative on a domain because that’s where most people link to when referring to a website. Another very important aspect in your site architecture is how your pages link to one another. This is referred to as interlinking. Once a search engine finds your site on the web, it starts to crawl and navigate through the site links. The way you choose to link to pages within your site is called interlinking. It is very important because it sends a clear message to both search engines and people what you think is the most important content on your site. Because of this, you should put your most valuable content on positions where it is linked to the most within your site. Remember, search engines and users cannot get to content on your site to which you do not link to, so you should avoid having the so-called “orphan” pages on your site. The category page on the far right is not linked to (both horizontally and vertically) and is, therefore, an “orphan”. Neither search engines nor people can discover this Category, the Product, and Product Detail pages. Since every site and business are unique there is no right structure for your site. The most important thing is to keep your site structure clear to you and the people who are using it! Creating quality and relevant content for your site and structuring it in a meaningful way is fundamental for your SEO and business success.